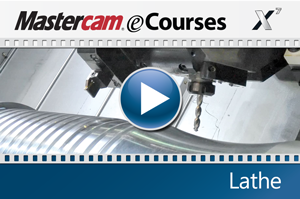 This eCourse is designed to familiarize you with the Mastercam user interface and provide the resources you need to become proficient with geometry creation and toolpaths for lathe applications. If you are new to Mastercam, it will help you quickly develop your Mastercam skill set; if you are already using the software, it will get you up-to-date and enhance your abilities. Below you will find an overview of the eCourse video content organized by tutorial and respective video segments. Each tutorial will walk you through creating geometry, applying then verifying toolpaths and generating G-Code for a machinable part. This course will take approximately 8 hours to complete.